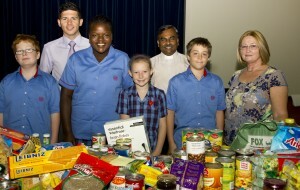 On Sunday 30 September, St Christopher’s Infant and Junior Schools took part in the annual Harvest and Zakat assemblies. This is a great way to get the children to experience the act of giving to those less fortunate. Both assemblies invited people to speak about the importance of giving. Friends from St Christopher’s Cathedral as well as a representative from a local Islamic charity joined us for this celebration. This year, we received a record number of donations so, a big thank you to all families for their generosity. Without the continued help and support of the St Chris community, we would not be able to support local charities and organisations in the way we do.